While driving, few sights are more horrific than seeing another motor vehicle heading straight towards you, knowing that an impact is imminent within seconds and that there is little to do to avoid it. Although head on car accidents are not common and consist of only about 2% of all car accidents, nearly 10% of all motor vehicle fatalities result from a head-on collision. Most cars undoubtedly have an airbag which, if properly deployed, might save your life or at least spare you from catastrophic injuries. However, if the car coming at you is at a high rate of speed or is a semi-trailer, the chances of your surviving or escaping with minimal injuries are slim regardless of the airbag being properly deployed. 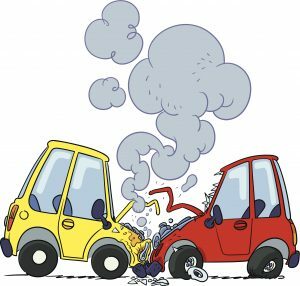 What are the Causes of a Head On Car Accident? Most head-on car collisions occur from another driver losing control of the vehicle, usually from the opposite driving lane, and crossing over into your lane of travel. In some instances, another driver becomes confused or unaware that he or she is driving the wrong way on a one-way street. If the incident occurs on a freeway, it is likely you and the other vehicle are traveling at least 60 miles per hour, increasing the likelihood of a catastrophic outcome. In a head-on crash, the rotation of your vehicle and the possible ricochet off the object or other vehicle is instrumental in the seriousness of the collision. It is not unusual for your car to experience the initial impact and spin off the road or into another vehicle or guardrail. Seats can also break free. At the moment of impact, your head and body, traveling at the same speed as your car, continue to be hurled forward and you can strike the steering wheel, dash or window. Explosions from a violent collision are common. Another consideration in a head on crash is that although your body comes to a stop, your internal organs are still moving and can cause serious injury or death. If you do survive a head on crash, you often have to deal with life-changing circumstances such as impaired movement, cognitive dysfunction, loss of employment and your ability to enjoy the life you once had. If a loved one was killed in the accident, the survivors can bring a wrongful death action to collect for certain damages including funeral and burial expenses, medical, and loss of companionship and love. The victim’s family, which only includes the spouse, children and issue of deceased children, can also recover for the economic loss or the loss of present and future income that the decedent would have earned over their working life. The decedent’s estate can bring a survival claim for pain and suffering if the decedent survived for a time before succumbing to injuries as well as for any medical expenses. In cases like these, you need the skills, experience and resources from an accident injury lawyer accustomed to handling catastrophic injury cases such as Neil Burns and Roshan Jain. Issues of liability are not uncommon and you will need a forceful advocate to obtain the maximum compensation possible for your injuries. Letting any law firm handle your case may result in your not obtaining all the compensation to which you are entitled. Contact his office today for a free evaluation of your claim.